Breaking News: Woman Cyclist Assaulted and Battered in Castro Valley by at least three people driving at 50 miles per hour. One of our members was assaulted and battered by at least three people launching projectiles while driving at 50 miles per hour. CHP has passed this incident to the local Sheriff. You can watch a video deconstruction of the incident below. This is a developing incident with details to follow. One thing is certain: if she did not ride with her camera absolutely nothing would be done to the assailants. How many cyclists did they assault prior to this incident? How many more would they assault and how many copycats might become emboldened if we do not collectively demand enforcement? Even if law enforcement refuses to enforce the California Vehicles Codes and Assault and Battery in this case, our Incident Management System will always have highly detailed information on this incident in the event this driver repeat offends. It’s much more difficult for law enforcement to refuse to enforce the laws when you can supply a pattern of behavior. Unbelievably malicious! 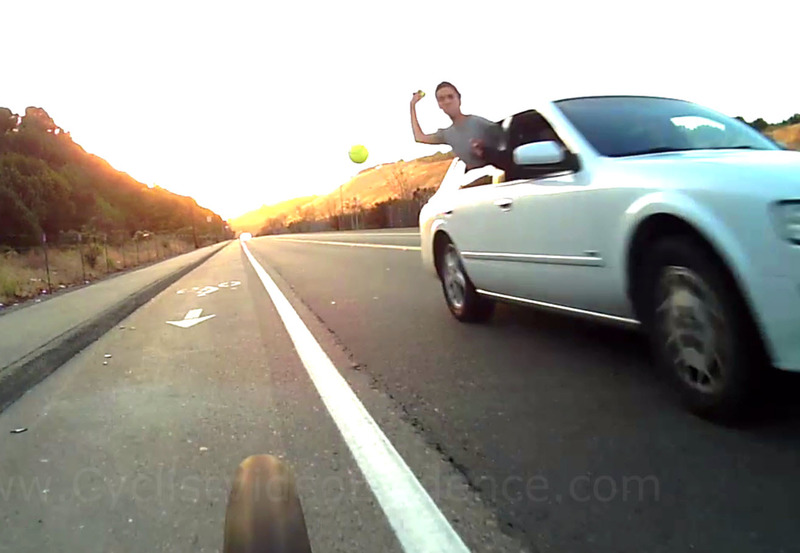 Front and rear passengers coordinate a premeditated attack on this cyclist that could have caused a major collision. We need to find these guys so they do not attack others. They obviously feel invincible, given the superior speed of the car. Luckily, their dangerous behavior was captured on video. Protect yourself with a camera. Don’t forget to keep it on. And yet the Alameda County District Attorney didn’t feel that a cyclist was worth protecting. They didn’t bring charges until we threatened to sho up at their offices with 450;cyclists in time for the six o’clock news demanding an explanation of what they were going to do. Then they brought charges that were later dismissed. You should read our extensive report documenting our work as the cyclists’ advocate in this case. Having a camera is the only way to ensure you are protected from this kind of behavior. Law enforcement needs to be held accountable to enforce the laws that protect cyclists, and everyone for that matter. If there hadn’t been a video of this incident, the cyclist would have zero chance of ensuring these people are held accountable. Thank you for this amazing service! I’m thinking about the large number of people who must rely on bikes as basic transportation, face this kind of abuse regularly and can’t afford the price of a video cam. Has anyone figured out a solution for this part of the bicycling population? We work with cycling organizations and their cycling communities to lower the cost of video cams. Please go to the top menu and look under Projects -> Local Innovation -> Alameda Eden Area Camera Subsidy Program as an example program. The Cycliq Fly6 cameras are sold for $139 so they are one of the least expensive and the one we highly recommend. Please contact us using our Contact Us form above if you would like to discuss this. This is just one instance. There are many others out there that don’t get caught on camera or reported. Yes, our police need to take this type of thing seriously. Personally, I was cycling over a bridge in Fremont with no shoulder. An AC Transit bus driver decided it didn’t matter that I had no other place to ride so passed me way too close. I did report it to AC Transit but never heard back and did not follow up (my mistake). You are right, this is only one incident which is why cyclists need to ride with a camera and report their incidents to the police and to our free Incident Management System. Your AC Transit bus incident is exactly why we created our Incident Management System. Cyclists can always enter their incidents into our system and we will not reject them as law enforcement sometimes does. Our system also never forgets. Sadly, driver’s convictions are often expunged after they pay a minimal fine and do minimal community service as in the Glendale assault case on our home page. We need you to enter your incident so other cyclists can identify that driver as a repeat offender should it happen again. It’s not too late, please enter it today.